All good. They’re pretty easy going and nothing is a big deal for them. They can solve anything. All great. Cleaning, rooms and everything. Staff was helpful, historic building was fun and rooms were clean and very comfortable. Where to find Boulder hotels near an airport? 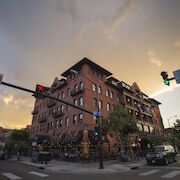 How can I find hotels in different Boulder neighborhoods? Where can I find hotels in Boulder that are near tourist attractions? Should you be searching for upscale or budget lodging options in or around Boulder, it's good to know that Expedia has many possibilities. About 25 places to stay can be found within a 0.1-kilometre (0.06-mile) radius from Boulder's downtown. 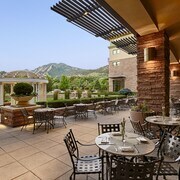 Within 1 kilometre (0.6 miles) of Boulder's center, visitors can find a range of hotels, including the Boulder Marriott and Residence Inn By Marriott Boulder. 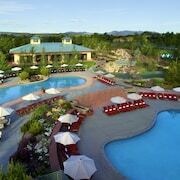 Broomfield, 20 kilometres (12 miles) from the heart of Boulder, is a hotel-rich neighborhood that is home to 6 hotels. In Broomfield, the Renaissance Boulder FlatIron Hotel and Omni Interlocken Hotel are some popular options. Louisville another prominent Boulder hotel district is 11 kilometres (7 miles) from downtown. Louisville's accommodation options are the Residence Inn by Marriott Boulder Louisville and Courtyard Boulder - Louisville by Marriott. Hotels in Longmont which is around 20 kilometres (13 miles) away include Residence Inn by Marriott Boulder Longmont and Springhill Suites by Marriott Boulder Longmont. 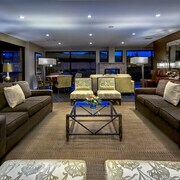 Expedia hotels in Firestone include Comfort Suites Longmont and Best Western Firestone Inn & Suites. Firestone is 30 kilometres (18 miles) away. For those who are planning a trip to Boulder to visit the Chautauqua Park, the National Center for Atmospheric Research and of course the University of Colorado-Boulder, why don't you stay close by? Places to stay that are close to the Chautauqua Park include the Hotel Boulderado and the Briar Rose Bed and Breakfast. 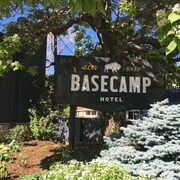 The Hotel Boulderado is 2 kilometres (2 miles) from Chautauqua Park, while the Briar Rose Bed and Breakfast is situated 2 kilometres (2 miles) away. The Best Western Plus Boulder Inn is situated 3 kilometres (2 miles) from from the National Center for Atmospheric Research. The Rodeway Inn and Suites The Broker is also located within an easy walking distance. 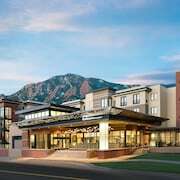 The Courtyard by Marriott Boulder and the Millennium Harvest House Boulder are good accommodation options if you'd prefer to stay close to the University of Colorado-Boulder. It's 3 kilometres (2 miles) to the Courtyard by Marriott Boulder and 0.9 kilometres (0.6 miles) to the Millennium Harvest House Boulder. Are you after the most convenient airport for your trip to Boulder? Denver International Airport is 55 kilometres (33 miles) drive away. What are the most popular Boulder hotels? Are there hotels in other cities near Boulder? What other types of accommodations are available in Boulder? Explore Boulder with Expedia.ca’s Travel Guides to find the best flights, cars, holiday packages and more!